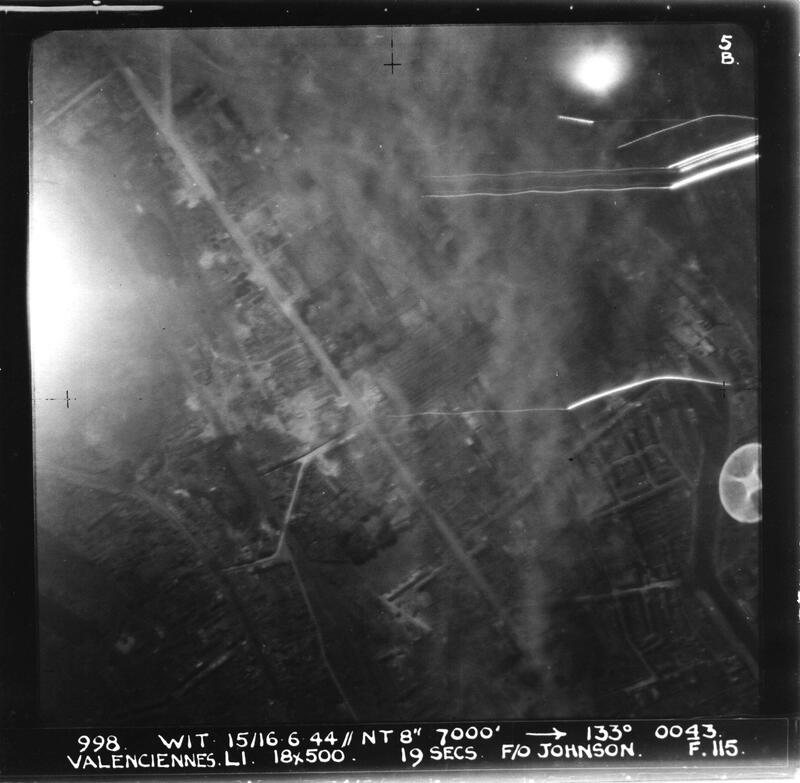 184 Lancasters carried out night operations to bomb railway yards at Valenciennes and Lens. Up about noon. Down to flights after dinner and found myself on tonight. Flying from “C” flight in “F” for Fox. Went out and gave it the “once over” with the boys. Seems to be OK, a Mark I with only 26 hours on it – no “box of tricks” on it. The gunners were disgusted with the guns on it – full of rust apparently, however they worked on them and got them OK.
At briefing, target was found to be a railroad yard at Valenciennes (never been bombed before). Everything went wrong! Crew late getting to aircraft. Port gun in mid-upper turret U/S and bags of flap and panic until fixed. Just as it was fixed the bomb aimer came rushing out - he’d lost his proforma. He went tearing in on a bike to control to get another and meantime the wireless operator found it in the grass outside. We got all ready to go but never thought we’d make it but Bob got back just in time, then as we were going out to take off (last) the flight engineer’s helmet was found to be U/S. Got the spare which was too big and set off (I was in a spin by this time - didn’t know whether on my head or my heels). Weather hopeless. Cloud supposed to be layered but I couldn’t find any layers so flew through it at 9,000 ft until about the enemy coast where we came out above it. We didn’t get any opposition on the way in. Searchlights at the coast but they couldn’t see us through the cloud. Early at the target so we had to orbit. When we did bomb all the bombs hung up (distributor U/S) and Bob jettisoned each way off the target I think. Saw two combats and two fighter flares just past the target so jinked all over and started home late. Did 210 all the way, jinking occasionally for fighter flares and especially searchlights at the coast. Just got to within three miles of enemy coast when some predicted flak bounced the aircraft (which is close – and the last straw too). Jinked all the way home. Saw two combats about a mile to port over England. Set wrong coordinates and lost time that way. Last to land and what a trip! Anaka got the chop. Saw three scarecrows over target one may have been him. Lost my hat. Think it’s in the aircraft.